The post Jesse Ventura Body Slams US Attorney at Mongols MC Trial appeared first on Motorcycle Profiling Project. This entry was posted in Motorcycle Profiling Project on November 29, 2018 by Webmaster. One of the long-term implications of the Waco biker massacre that occurred on May 17, 2015 is the continuing erosion of the rights base of motorcycle clubs in Texas. Over 3 years after 9 people were killed at a Twin Peaks restaurant in Waco, and nearly 200 individuals were arrested and given $1-$2 million-dollar punitive bonds, charges have been dropped against all but 24 persons, and recent reports indicate the high likelihood that most of those will be dismissed as well. Despite these dismissals, motorcycle clubs are still being profiled and harassed while participating in Constitutionally protected political and charitable gatherings. And at ground zero, members of motorcycle clubs in Texas have endured extensive harassment without cause. Motorcycle clubs participating in an organization called the United Clubs of Waco (UCoW), recently attended a Copperas Cove City Council meeting to report to council members the extensive harassment and profiling that occurred at a recent charitable event to raise funds for Veterans sponsored by the UCoW. Charitable events are explicitly protected by the First Amendment to the US Constitution and actions impacting participation or participants in such events are prohibited. Violations also expose law enforcement, and in turn the state of Texas, to exorbitant civil liability claims, such as the hundreds of millions in claims currently pending related to Twin Peaks. Legislative action prohibiting the practice of motorcycle profiling, particularly following the Twin Peaks incident, is an empirically a simple solution that reduces incidents of profiling with zero negative fiscal impact. The Copperas Cove Silverbacks, one of the 70 clubs that belong to the United Clubs of Waco and the Killeen nonprofit We Leave No One Behind, reported to the council that the Copperas Cove Police Department had an over-the-top presence that dissuaded residents from attending a bike washing fundraiser in support of veterans Sept. 17 at the nightclub TrackSide on Joe’s Road off U.S. Business Highway 190. The actions of the Copperas Cove Police Department are in violation of the basic principles of the First Amendment. Charitable events are considered expressive conduct. If, as alleged, police intimidation chilled participation in a charitable fundraiser for Veterans, then a violation of the First Amendment has occurred. Supreme Court precedent clearly establishes that charitable appeals for funds…are within the protection of the First Amendment.”2 Sponsoring and supporting charitable community events, like the solicitation of funds, “is characteristically intertwined with informative and perhaps persuasive speech seeking support for particular causes or for particular views on economic, political, or social issues.” Id. The harassment being experienced by members of the UCoW is a microcosm of the larger motorcycle profiling epidemic enveloping nearly the entire state of Texas. Independent of the victims being damaged by civil liberty violations, these incidents also expose law enforcement and government entities to massive financial liability. Statistics validate the epidemic. The National Motorcycle Profiling Survey 2017 further exposes widespread targeting of charitable and political events. Fortunately, a simple and cost-free legislative solution exists. Washington State, the first state to adopt legislation against the practice, is the only state in America that has recorded a reduction in motorcycle profiling incidents since 2012. 4 An explicit prohibition against motorcycle profiling combined with a mechanism of relief for victims of profiling would substantially reduce these incidents from occurring in the first place. The post Texas Cops Harass Motorcycle Club Fundraiser for Veterans appeared first on Motorcycle Profiling Project. This entry was posted in Motorcycle Profiling Project on November 27, 2018 by Webmaster. In the short-term, the officers involved should have their employment terminated and all officers involved should be held civilly and criminally liable. In the long-term, legislative solutions prohibiting discrimination and profiling would protect against civil liberty violations, and therefore exposure to civil liability, by reducing the probability of such incidents occurring in the first place. The NCOC also supports the bar owner’s constitutional right to pursue an occupation, which was infringed by officers when the owner was told that he must ban motorcycle club colors in his bar following the brawl. Agents of the government such as law enforcement officers are also constitutionally prohibited from coercing or pressuring a private establishment to discriminate. There are differing accounts of what started the brawl. The bar owner, for example, reports that the police were the agitators and aggressors. 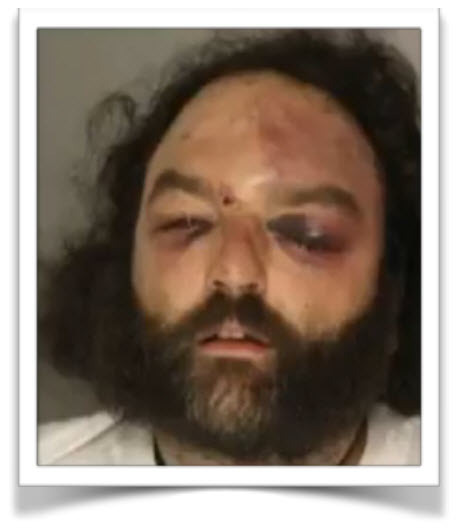 But regardless of what started the fight, punching a completely defenseless Frank Deluca in the head and face 23 times while his arms were being held and his hair pulled back, as irrefutably shown in video, is unconstitutional use of excessive force even if there was probable cause for an arrest, which, according to defense attorneys, eyewitness accounts to local news media, and the recent dismissals, is highly improbable. “Without a doubt, the most controversial issue in American policing is the use of force by police officers. On too many occasions, we have seen newspaper headlines reporting that an individual has been brutalized or, worse yet, killed by the police. The consequences of excessive and deadly force have been severe, affecting both police organizations and the communities they serve.” 3 The events of October 12th are a perfect demonstration. The owner of Kopy’s, who was doused with pepper spray, said after the fight, a police lieutenant blamed him. The owner said the lieutenant also told him to post a dress code and that he doesn’t want to see any bikers in his bar. The actions of the officers at Kopy’s bar were simply egregious and inexcusable. Aside from the direct harm caused by their conduct, these officers have exposed the department, government, and taxpayers to huge civil liability damage for irrefutable violations of the constitution. In the short-term, the NCOC believes that all officers involved should ultimately have their employment terminated when allegations of excessive force or coercion are confirmed through investigation and due process. The NCOC supports the efforts of those violated to pursue relief through civil rights claims. Longer-term, the NCOC believes that legislative solutions to address the issue of motorcycle profiling, combined with basic training and education related to current constitutional prohibitions against government discrimination, would reduce similar incidents of profiling and discrimination going forward. This incident is further confirmation that video is the best weapon available in the fight against motorcycle profiling and discrimination. Without video, law enforcement’s version of events would likely go unchecked and 4 individuals would still be facing aggravated assault and riot charges. Indeed, video has been the key factor in many motorcycle profiling successes. Video is incontrovertible in many cases. In Washington State, video of state troopers crawling through the bushes on the grounds of the Capitol during biker day at the Capitol convinced legislators that motorcycle profiling had followed us to the very steps of the Capitol. In Maryland, the other state with a law addressing the issue, video obtained through a public information request proved that the state police participated in a mass profiling stop, despite complete denial. Video is often critical in individual incidents of profiling as well. In Kansas City, an off duty officer moonlighting as a security guard was caught threatening a 1% club member with arrest for trespassing because the Quick Trip didn’t allow 1%’ers on their property. Video of the incident led to the officers termination from both Quick Trip and the KCPD. Video capability is everywhere. And the First Amendment absolutely protects your right to video record law enforcement in public as long as one does not interfere with officers legally carrying out their duties. Seeing is believing for most people. And video preserves an incident fo all to see. What can an individual immediately do to help fight motorcycle profiling in Pennsylvania and across America? Participate in the National Motorcycle Profiling Survey 2018, which helps the fight against motorcycle profiling! It only takes a few minutes to impact legislation nationwide! The post Pagans Charges Dropped After Video Shows Excessive Force appeared first on Motorcycle Profiling Project. This entry was posted in Motorcycle Profiling Project on November 19, 2018 by Webmaster. The post Authorities Misapplying Texas Law to Disarm Bikers appeared first on Motorcycle Profiling Project. A jury in El Paso, Texas decided Friday that it is illegal for a member of the Bandidos Motorcycle Club to possess a weapon in the state. DT, a member of the BMC in El Paso, was arrested October 16th, 2017 on his way to work for Unlawful Carrying Of A Weapon. Although it was conceded by all sides that DT had no felony record and was not a convicted criminal, the prosecution argued, and the jury agreed, that merely being a member of the Bandidos was enough to consider an individual a gang member prohibited from exercising their 2nd Amendment rights. DT’s case is just one in a long list of similar incidents. 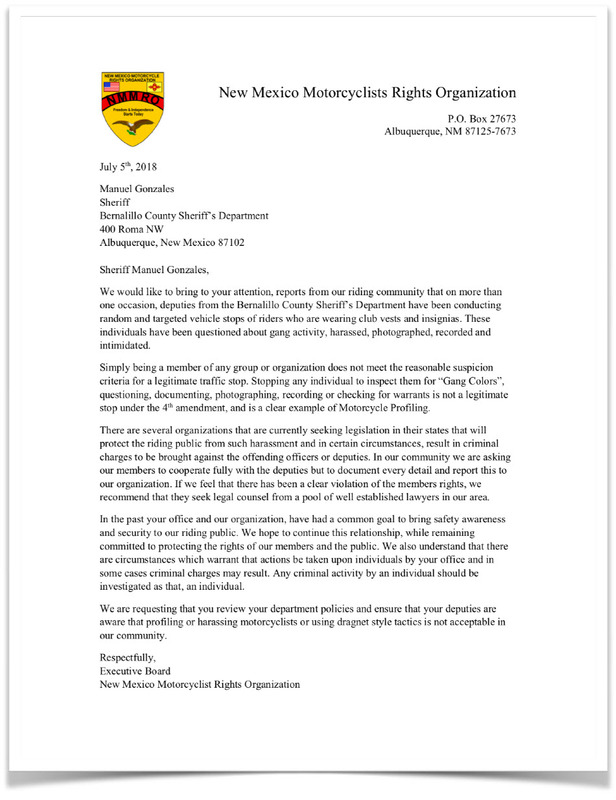 The MPP believes that successful convictions such as DT’s further embolden law enforcement across Texas and other states to continue their campaign to disarm the Bandidos and other motorcycle clubs and their members based solely on association. DT’s case represents only one case in a lower court. The legality of motorcycle club members in Texas possessing weapons will ultimately depend upon successful judicial opinions at the court of appeals level or higher, setting precedent against what the MPP believes is an unconstitutional application of Texas law. The attempt to disarm individuals because they belong to an organization in which other members have committed crimes, regardless of personal guilt, is an extremely dangerous slippery slope that could ultimately impact many sectors of society far beyond motorcycle clubs. DT was on his way to work last October when he was pulled over for a traffic infraction. When the El Paso officer asked whether he was carrying a weapon, he indicated he was legally transporting an unloaded firearm. DT does ranch work, and ranchers often carry firearms to defend against predators and snakes threatening livestock. DT was informed that it was illegal for a member of the Bandidos to possess a weapon in the state of Texas because they were considered a criminal street gang. He was charged under Texas Penal Code Sec. 46.02, UNLAWFUL CARRYING WEAPONS. He paid a $1,500 bond and was released. Until this incident, DT had no criminal record – other than a DUI a decade ago. He is a combat veteran, serving in the Army, 1st Calvary Division for 5&1/2 years, 2 of them in Iraq. The next day, the jury deliberated and agreed with the prosecution. In this jury’s opinion, being a Bandido is enough to prohibit an individual from legally possessing a weapon in the state of Texas, even if the individual has no criminal record. What Does DT’s Case Mean For Everyone Else? Independent of the personal impact on DT, his case has implications for others. His trial does not set precedent for others because it’s a lower court decision. If the case is appealed, however, the outcome of that trial would set precedent for others in the El Paso court’s jurisdiction. But even if this trial doesn’t set precedent, this conviction is likely to embolden law enforcement to further embrace this tactic in El Paso and across the state of Texas. As reported directly to the MPP from victims of blatant and obvious mass profiling, the same day the jury in El Paso handed down a guilty verdict, members of another 1% club having a gathering at the Stockyards in Fort Worth were warned that it was illegal for members of motorcycle clubs to possess weapons in Texas even if those members held valid CWP’s. Indeed, the Motorcycle Profiling Project has repeatedly reported on the rising trend in some states to revoke the Second Amendment rights of MC members, and how MC members are being arrested for unlawful carry without legitimate cause. The MPP has even issued a travel advisory warning all motorcycle club members of what the MPP believes is an unconstitutional application of Texas law. But that is exactly what is happening in Texas. The idea that the government can impose a restriction such as prohibiting the right to posses a weapon in a shall issue state, based solely on association, is completely inconsistent with constitutional principles. Properly applied, wouldn’t the state have to show that an individual specifically participated in the criminal acts referenced? This interpretation of Texas Penal Code Sec. 46.02 would both preserve the 1st Amendment right to associate and the doctrine of personal guilt. Why This Could Mean The End of Clubs As We Know Them? If this trend continues in Texas, California, and New York, how long before it spreads to other states? If gang laws themselves are any indication, the tactic could spread coast- to-coast. According to the National Motorcycle Profiling Survey 2017, 99%+ of MC members strongly support the 2nd Amendment and only 2% of the members of even 1% clubs have a felony record. How many individuals that currently have a legal right to posses weapons would knowingly sign away those rights to join a motorcycle club? If you’re in a motorcycle club this does not sound far-fetched because it’s happening now. If you’re not in a motorcycle club, do you know someone who is? That’d make you an associate. And even if you don’t associate with MC members, it’s important to understand that protecting the most subversive speech and associations is the highest constitutional priority on which all other expression and associational rights depend upon. 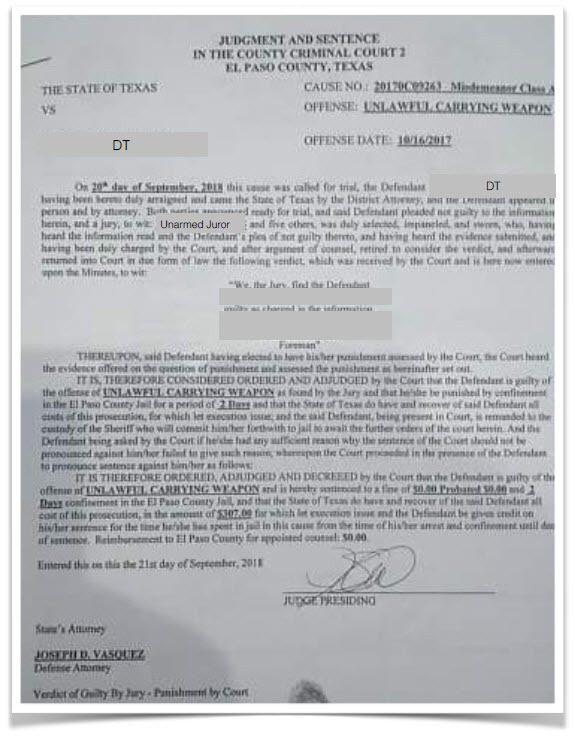 The post Texas Jury Says Its Illegal for Any Bandido To Possess A Weapon appeared first on Motorcycle Profiling Project. This entry was posted in Motorcycle Profiling Project on September 25, 2018 by Webmaster. 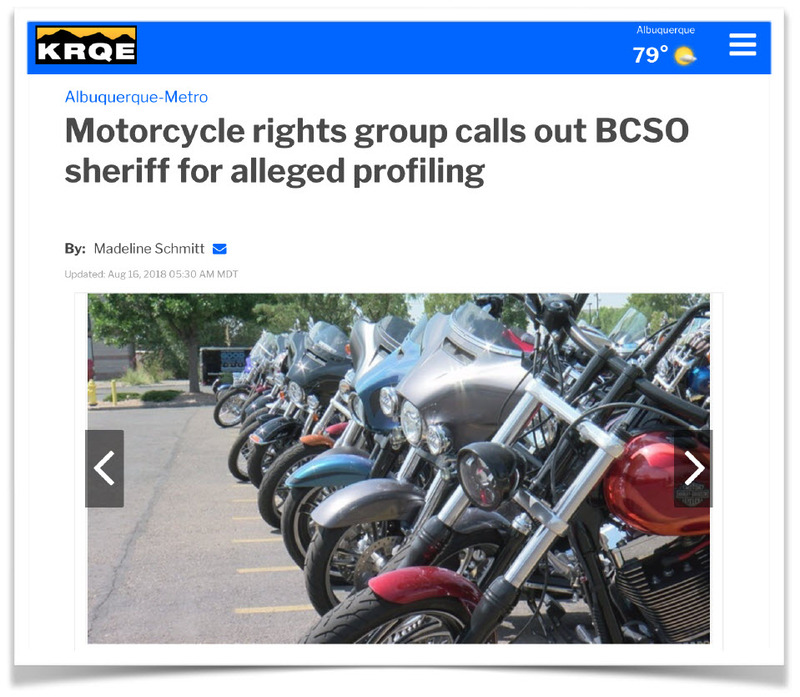 The post After Media Pressure Sheriff Agrees to Address Motorcycle Profiling appeared first on Motorcycle Profiling Project. This entry was posted in Motorcycle Profiling Project on September 10, 2018 by Webmaster. 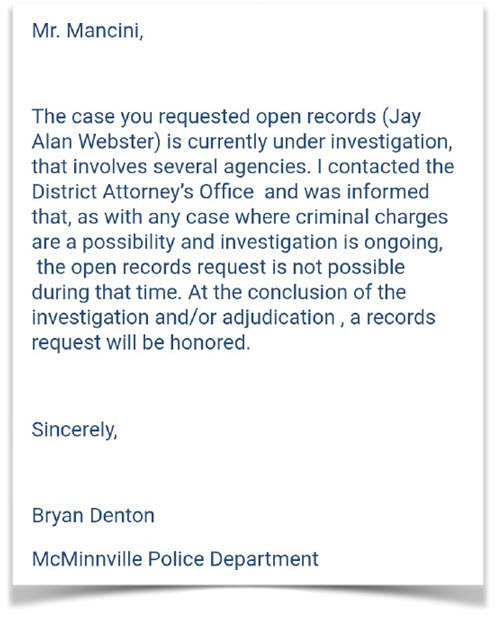 The McMinnville Tennessee Police Department has been refusing to release any public information related to the death of 21-year-old motorcyclist Jay Alan Webster, probate member of the Silent Creed Motorcycle Club, killed on July 7th, 2018, after former Warren County Sheriff Kenneth Taylor failed to yield and hit Webster while driving his Toyota SUV. 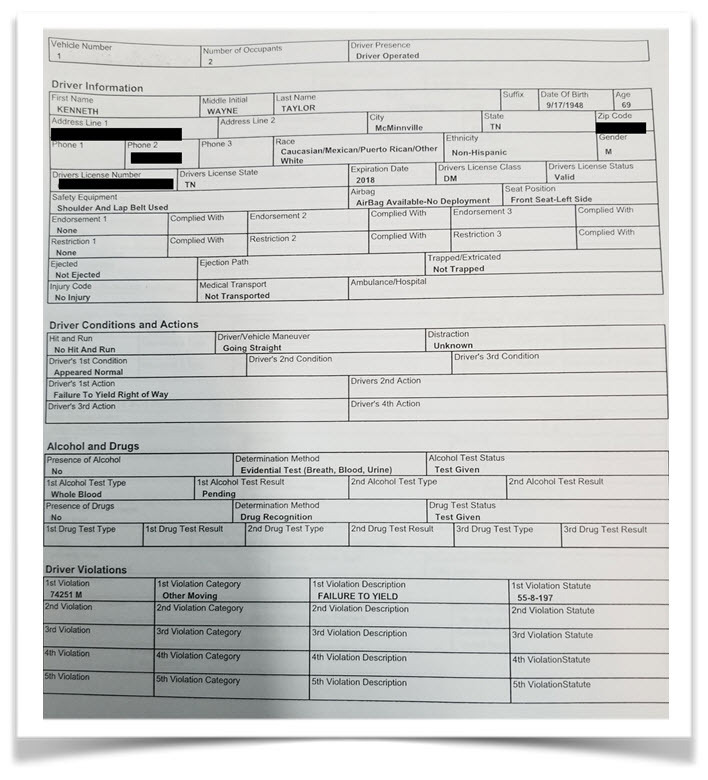 But after more than a week of stiff public record request denials, and less than 24 hours after public demands to release the information was published on motorcycleprofilingproject.com, the McMinnville Tennessee PD has finally released the accident report. The release of public information is a small but important victory for motorcyclists in Tennessee because it demonstrates what a focused and unified grassroots motorcycle rights campaign can achieve. Yet important unanswered questions remain and the grassroots pressure must continue to be a voice for Jay Alan Webster. The accident report indicates that the although there were no drugs or alcohol found at the scene, the former sheriff was administered a blood test to determine the presence of drugs or alcohol, but the results were still pending when the accident report was filed on July 8th, 2018, more than a month ago. Why have the results of Taylor’s blood test not been released? Do the results explain why an investigation into further charges is still on-going? Release the Results! Motorcyclists Nationwide Demand It! Rodney Mancini, a National Council of Clubs (NCOC) participant and Tennessee motorcyclist that originally requested the accident report from authorities, followed-up with a public records request for the results of Taylor’s initial blood test. The McMinnville PD rejected Mancini’s request because criminal charges were pending. The McMinnville PD can arguably exempt these results until the investigation is complete, but the results could also be released through discretion. The public simply has a right to know if a former sheriff was under the influence when he killed a 21-year-old man. Serve justice as dictated by law and charge former sheriff Kenneth Taylor with Vehicular Homicide for the death of Jay Alan Webster, a probate member of the Silent Creed MC, if the results of the test indicate the presence of drugs or alcohol OR if Taylor’s conduct created a substantial risk of death or serious bodily injury to Jay Allen. The grassroots pressure demanding justice for motorcycle clubs and their members through a unified voice must continue, so individuals negligently killing bikers are at least legally forbidden from driving a vehicle. The life and memory of Jay Alan Webster demands this at a minimum. The post Report Released Under Pressure After Ex-Sheriff Kills TN Biker appeared first on Motorcycle Profiling Project. This entry was posted in Motorcycle Profiling Project on August 10, 2018 by Webmaster. Source:: Former Tennessee Sheriff Kills MC Member and Still Not Charged? This entry was posted in Motorcycle Profiling Project on August 7, 2018 by Webmaster. Re: The imaginary war between MC’s and government. The National Council of Clubs (NCOC), dedicated to protecting the legal and political interests of motorcycle clubs coast-to-coast, is extremely concerned about an imaginary war between motorcycle clubs and the government, created in the minds of some law enforcement and government prosecutors, playing itself out in courthouses across America. This ideology of war has followed us to the steps of the criminal justice system, where visibly draconian security measures have been implemented based on unsubstantiated and ambiguous sources, even though there have been no validated examples of motorcycle clubs storming courthouses during a trial. A topical example reinforcing such irresponsible claims has been recently memorialized in a Texas District Attorney’s press release relating to the supposed and constant threat of violent retaliation that prosecutors face during biker trials. Despite the absurdity of the claim that any motorcycle club would storm a courthouse or target prosecutors with violence, there are no consequences for these falsehoods meant only to perpetuate fear and reinforce false narratives about 1% motorcycle clubs. And, of course, these false threats are used to justify excessive security measures during biker trials. This fear-based tactic has real implications. Inside the courtroom, juries will be biased against biker defendants because of the perception that their safety is in jeopardy. Outside the courtroom, law enforcement will increasingly treat those exercising the constitutional liberties of association and expression as a direct violent threat based on inaccurate information and training. Incidents of motorcycle profiling and selective enforcement of the law will likely continue at epidemic levels until a more accurate narrative is reported by the media, both grassroots and mainstream. 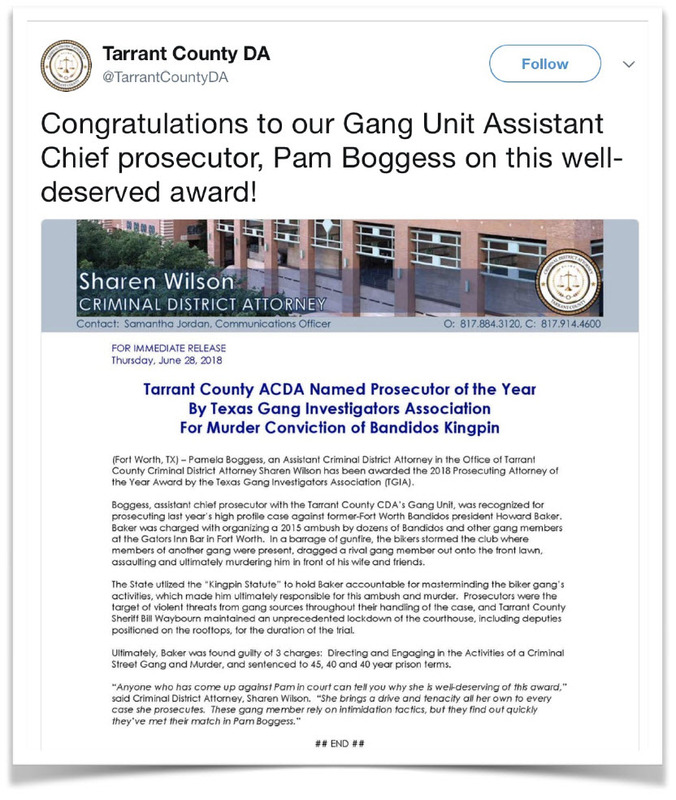 Sharon Wilson, the Tarrant County District Attorney, issued a press release on June 28, 2018 (below) reporting that Assistant District Attorney Pamela Boggess has been named “2018 Prosecutor Of The Year” by the Texas Gang Investigators Association for the successful prosecution of Ft. Worth Bandido Howard “Drifter” Baker, convicted last year of directing a criminal organization. What gang sources? What information did these sources provide? Why has no one been arrested or prosecuted for these threats? Unfortunately, this “made for Hollywood” scenario in Ft. Worth is NOT an anomaly. Similar incidents in Waco and San Antonio courthouses involving enhanced security measures based on fictitious threats, with the same unanswered questions, have been widely publicized in the media. In fact, NCOC participants were present during both trials and witnessed firsthand the ridiculous security measures employed, again based on unsubstantiated claims. In Waco, the Sheriff’s Office constructed a fence around the entire courthouse and paid hundreds of thousands for extra security at the courthouse, and for personal security for prosecutors away from the courthouse. In San Antonio, a person was required to go through two metal detectors and have their ID photographed before they could enter the courtroom and sit in designated seats. Marshals surrounded the defendants in court, even when the jury was present. The idea of using a tragic incident, whether it be a trial or a shooting, to advance a campaign of fear and draconian security, is not a new one. And it’s particularly not new in Texas. Years before the mistrial in the first Waco prosecution of Dallas Bandido Jake Carrizal, Sgt. Swanton of the Waco Police Department declared on national TV, as nearly 200 people were rounded-up to ultimately be arrested on generic fill-in the blank arrest warrants based solely on their associations, that they had received credible threats that bikers had “green-lit” law enforcement and were coming to Waco to retaliate. 1 Immediately following the incident at Twin peaks Waco law enforcement issued a statement warning “bikers to stay off the streets because it was difficult to distinguish between law-abiding riders and those bent on criminality.” The local Harley Davidson dealership was even closed. 2 The Federal Board of Prisons, the Texas Border Intelligence Agency, and the Texas Department of Public Safety all issued bulletins based on these reports about retaliation. 3But in the end, after the national spotlight had disappeared, authorities admitted that none of the threats of retaliation were found valid or true. Furthermore, NCOC participants observed firsthand Waco PD and Texas DPS officers admitting under oath during the Carrizal trial that threats reported by Swanton in 2015 turned out to be false and unsubstantiated. But even after the Waco PD’s original story started to fall apart, most of the media that originally swallowed Swanton’s narrative without question, never doing their own investigation or fact checking, never went back to correct the record even though many were present during this testimony. After the smoke and mirrors are removed, no valid threat of violence from motorcycle clubs against law enforcement or government authorities exists. An NCOC participant from Nevada with vast trial experience, including trials with excessive security issues, confirms that authorities have zero historical basis when he writes, “We have asked judges or prosecutors to find a biker trial where they have had court issues, and they cannot.” But the headlines have already done their perceptual damage. The outlaw image is simply too easy to exploit, too easy to sensationalize, and too easily manipulated to generate real fear. 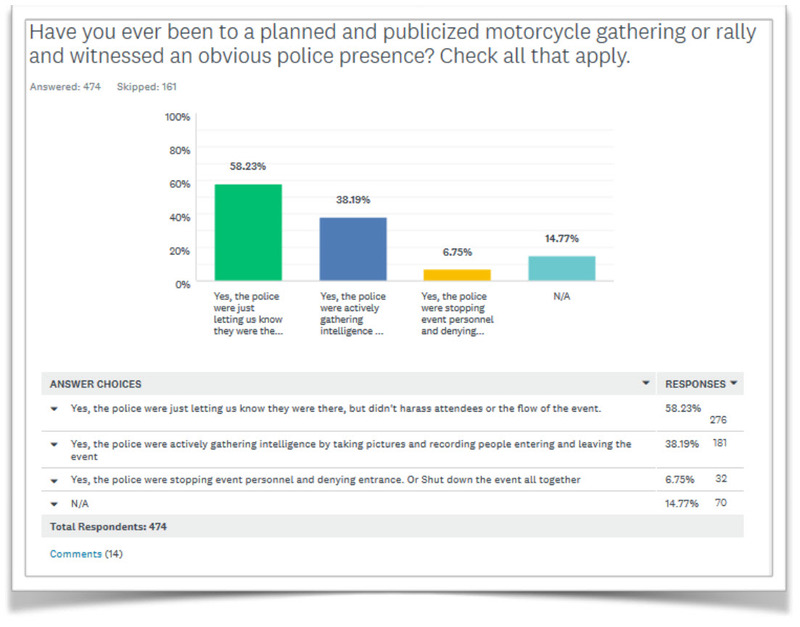 Fear in the eyes of jurors, law enforcement, the general public, and even other motorcyclists. The NCOC believes that public officials and law enforcement should be challenged by the media when they feed reporters sensationalized rhetoric. The media should demand an answer to these questions before irresponsible and one-sided messaging is used to generate fear and hysteria that has tangibly negative impacts on motorcycle clubs and their members. The imaginary threats faced by law enforcement do not exist. But the ability to influence juries, justify draconian security on the taxpayer’s dime, and perpetuate law enforcement profiling and abuse is very real. Balanced media that highlights the positive contributions and attributes of the motorcycling community directly impacts the general perception that all bikers are dangerous. Beyond the inherent value of truth, reducing perceptions of danger can directly reduce mistakes made by police when dealing with bikers. The post The Imaginary War Between MC’s And the Government appeared first on Motorcycle Profiling Project. This entry was posted in Motorcycle Profiling Project on July 10, 2018 by Webmaster.